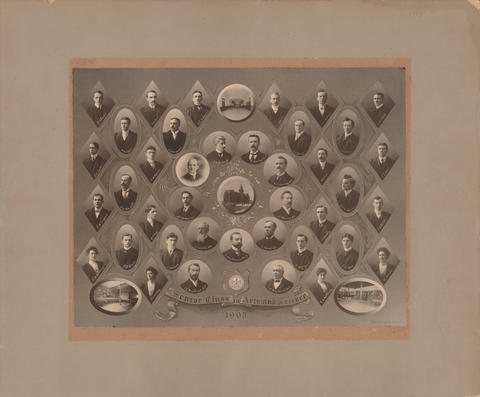 Item is a composite photograph of the Dalhousie University arts and science class of 1903. The photograph consists of portraits of E. M. MacDougall; F. J. Lindsay; S. S. Stairs; J. Malcolm; J. S. MacGregor; G. W. Loughead; G. R. Marshall; A. K. Ray; H. M. Upham; E. C. Locke; W. H. Coffin; G. H. Gordon; A. E. Davis; J. A. Fergueson; G. G. Sedgewick; A. A. Smith; L. L. Young; C. W. Matheson; W. H. Ross; H. H. Blois; D. M. Smith; J. G. Meek; L. B. Elliott; E. K. Amberman; J. A. Bradly; A. McG. Young; C. MacDonald; R. M. MacCurdy; W. Webster; J. B. Carr; S. M. Dixon; E. MacKay; W. C. Murray; H. Murray; J. Forrest; A. MacMechan; J. Leichti; J. E. Woodman; and D. A. Murray arranged in several rows on a painted background with photographs of the Forrest Building exterior, entrance hall, classroom, and library.